Ripples of aqua lighting flow across the entire stage as aerial silks float in from the wings, dancers holding blue fabric simulate the rolling of the ocean, actors dressed as luminous jellyfish enter, and a ballerina gracefully twirls about the stage. This was the ambiance that Rock Ridge High School created when they began their performance of Disney’s The Little Mermaid. 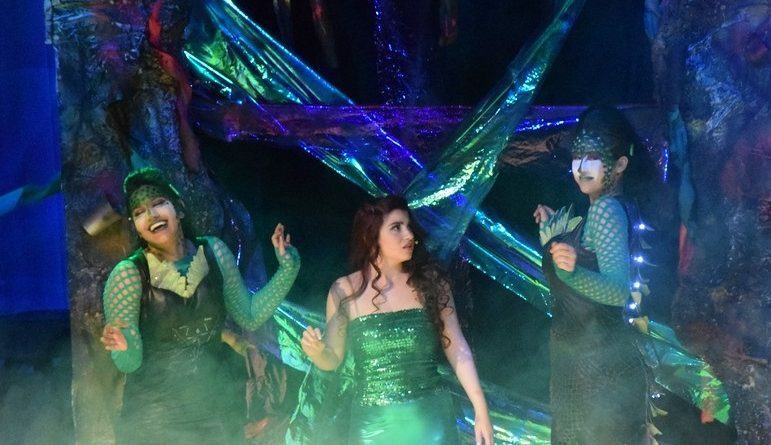 Based off the world-renowned movie, The Little Mermaid, first on Broadway in 2007, revolves around Ariel (Laila Gallant), a mermaid princess who dreams of walking amongst humans on the surface. One night, a storm causes the stalwart Prince Eric (Seth Cooper), whom Ariel had fallen in love with, to stumble from his ship into the sea; fortunately, he was rescued by Ariel. Desperate to meet Eric again after returning him to the surface, Ariel trades her voice to the sea witch Ursula (Jordan Green), for legs. In order to keep them, however, Ariel must kiss Eric before three sunsets have passed. Assisted by her friends Sebastian the effervescent crab (Kevin Lacey), the sheepish Flounder (Andrea Arias), and the spry, squawky seagull Scuttle (Deirdre Price), Ariel eventually defeats Ursula and finds a true happy ending with Eric. Every minute of this performance was packed with colorful costumes, high energy ensemble numbers, and astounding technical elements. The most distinct of these was their usage of aerial silks, complete with impressive dancers. Despite being somewhat distracting, they added a whole new dimension to the choreography, set, and lighting elements of the show, for they were used in imaginative ways, such as for ropes with sailors scaling up them. Chef Louis (Byron Salazar) brought his own ludicrous humor in “Les Poissons.” Salazar demonstrated exceptional vocals and a consistent accent while being fantastically comedic during his big number, chasing Sebastian around amusingly. In contrast to that slapstick humor, Ursula and her two sidekicks, Flotsam and Jetsam (Hannah Kane and Lucky Vemuri), brought a darker humor. The group worked together well, leaving a chilling vibe on stage. This bubbling ocean was brought to life by many remarkable technical elements. The lighting conveyed the emotions of the performance well; nearly all of the estimated 400 cues were seamless. Though some of the designs left actors in the dark, their prismatic choices set the scene for the spirited ocean. The set and props also brought a whole new level of magic to the show. The detail put into them was astounding, showcased in Ariel’s treasure cove, Ursula’s magic shell, and the ship of Prince Eric. Although some of the more ambitious set pieces made it hard for the audience to see, they brought to life the magic of the story itself.